Among the four books I've had published, none has been over 48,000 words. The current book I'm working on will almost certainly be no longer than this. It should be no surprise then that I'm always on the lookout for great short novels, genre-related or not. I never get tired of reading those authors whose every authorial fiber works toward compression. Maximum impact in a minimum amount of time. How is emotional conflict conveyed with brevity? How does the author create mood, atmosphere, a sense of place - the richness and fullness that come with a novel - and yet do it so succinctly? In a great short novel, the author may make something brief on the page seem longer than it is when considered by the reader in retrospect because of the density of the writing, the perfection of the details. The reader might well have the type of recollection akin to what Grahame Greene describes (in one of his memoirs) about his experience with Evelyn Waugh's Brideshead Revisited. Brideshead itself is not a short novel of the type I'm talking about, but Greene describes a passage that exemplifies the kind of reading experience I'm getting at. In this passage, a character takes a train trip. It's an important journey in the novel and a trip most evocative, and years after reading the passage, Greene remembered it as being several pages long. How shocked he was to discover, on re-reading the novel eventually, that the passage was barely a page in length. His memory had played a trick on him and his imagination had filled in a lot that wasn't actually on the page. To be able to accomplish this, Greene opined, was genius, and whether or not I would call it genius, I would at least say it's literary magic. A kind of magic made possible by the author's craft, use of language, and manipulation of details and sensations. The great short novels, in essence, achieve this effect in their entirety, leaving you marveling at how much the author relates, and suggests, in 80 or 100 or 120 pages. And I for one ask myself after I've finished such a book how the author pulled it off. These are books I love to re-read, not only because they're short and you can read them fast, but because I feel I can learn so much. Translated from German, this Swiss novel runs 101 pages in the edition I have. It's set in post-WWII Switzerland, in a girl's boarding school. Eve, the narrator, describes her time at the school when she was 14, and there is something about her narration that is at once ice-cold and burning with passion. She describes what becomes her obsession with the new girl at the school, the too perfect Frederique, and she formulates schemes and meditates on the ideas of control and madness. Is there a plot? 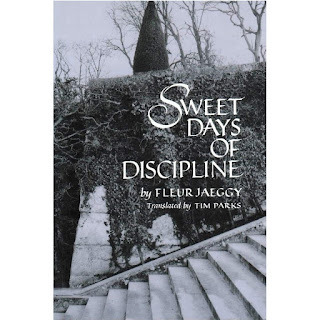 Not in the conventional sense, but the prose is crystalline and the tension in the story among the characters, the feeling that at any moment something among them might explode, in their isolated school in the Swiss countryside, lends the entire narrative tension and energy. There's not a slack moment in the 101 pages, and at the end, you realize that you've been reading the entire time as if holding your breath. Despite the lack of a point A to point B to point C plot, there's a lot of suspense. This book is a beautiful dip into darkness. 163 pages, a little longer than Jaegy's book. And Modiano always has plots - of a sort. 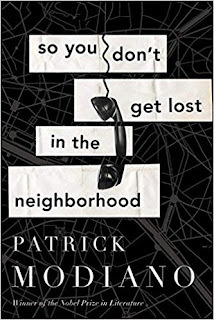 He loves mystery stories and the literary tradition of noir, and So You Can't Get Lost in the Neighborhood is another one of his explorations into memory and storytelling. Here the main character, Jean Daragne, gets a phone call that draws him into an old murder mystery that may be tied to a childhood trauma he experienced. Though he uses few words, nobody describes Paris more evocatively than Modiano. It's both a real city and a landscape of the mind for his recollection-haunted characters. Modiano has written nothing but short works over his 50-year career (over 30 books in all) and I'd say that length has served him well, if you consider a Nobel Prize a measure of success. His books are moody and ripe with atmosphere and full of people conducting investigations. And he'll keep working over similar themes from book to book. That's another approach that stands in contrast to the person writing the long novel that tries to pack in a bunch of things. Say what you have to say in short book after short book. Do variations on a theme. I love how Modiano does that. 77 pages in the translation I read. Clarice Lispector's final work (before she died) about a young woman named Macabea, a typist from northeast Brazil who goes to live in the slums of Rio. 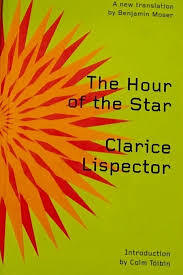 In the words of Lispector, she "was so poor that all she ate were hot dogs". She has nothing going for her in life and the novel doesn't end well for her, but somehow she is inwardly free. We get inside her heart and mind through language that is like no one else's because Lispector (and I think everyone who reads her says this) sounds like nobody else ever did. But it's not only Macabea's story. There's also the narrator telling us that he's telling us Macabea's story, and the continual back and forth between the two modes, as Colm Toibin says in his introduction, produces a novel in which "Nothing is stable in the text". From one sentence to the next, without warning or transition, the book swings from metaphysical speculation to Macabea's most comic or mundane actions. You empathize with her, then shake your head at her gullibility, then pull back when the narrator does and watch her with detachment. And the narrator, too, is hard to pin down. Continuing with Toibin, "It is hard to decide who to feel more sorry for. Macabea or the narrator, the innocent victim of life, or the highly self-conscious victim of his own failure. The one who knows too little, or the one who knows too much." I know one thing. I'll keep reading these masters of the short book to keep on learning from them. Novellas are absolutely underappreciated. Thanks for this.